Robin Marantz Henig tells the powerful story of an aging brother and sister who chose elder mediation as a path to reconciliation in the Slate Magazine article “The Ties That Blind: Elder Mediators help brothers and sisters stop fighting and make decisions about aging parents” posted at Slate.com on Thursday, February 9, 2012. Henig’s extensive research and penetrating insights provide a revealing view of the multi-decade long challenges faced by these siblings whose mutual suspicion and distrust had created a schism that prevented a functional working relationship even when the welfare of their beloved 98-year-old mother was at issue. With the help of Vermont-based elder mediators Neal Rodar and Susanne Terry, the beginnings of understanding and a will to repair the relationship began. Though the ending was tragic, a level of peace, previously unattainable, was achieved. “The most common cause of family conflict in the estate planning process is a lack of effective communication.” So begins an article by Mom Always Liked You Best co-author Rikk Larsen in the cover story of the September 2011 issue of the Costco Connection. In his article, Larsen shares typical barriers that families face along with some helpful communication tools. See the online version of the print magazine for the full text. Rikk Larsen, “Estate planning without conflict,” Costco Connection, September 2011, pp. 29-30. Sally Abrahms interviewed Rikk Larsen in the AARP Bulletin feature, The Author Speaks – Caring for Our Aging Parents: An elder mediator and author helps siblings negotiate care for Mom and Dad. “Mediator Larsen and his colleagues have poured their collected knowledge of how to navigate the tricky world of taking care of aging parents into a self-published book, Mom Always Liked You Best: A Guide for Resolving Family Feuds, Inheritance Battles & Eldercare Crises. The AARP Bulletin also featured an excerpt of the book. 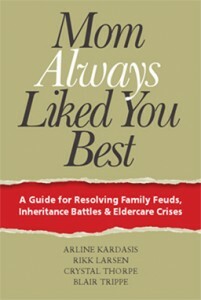 If you want to try your own hand at mediating family disputes, check out “Mom Always Liked You Best.” The book contains chapters on “Family Meetings,” “Including the Elder’s Voice,” and general strategies to use when trying to break an impasse. The SmartMoney – Encore blog is part of the Wall Street Journal Digital Network. Read the full post. Co-authors Blair Trippe and Rikk Larsen of Elder Decisions® were interviewed by host Emily Rooney of the WGBH television show, Greater Boston, about the team’s new book, Mom Always Liked You Best: A Guide to Family Feuds, Inheritance Battles & Eldercare Crises. The program aired on August 1, 2011. 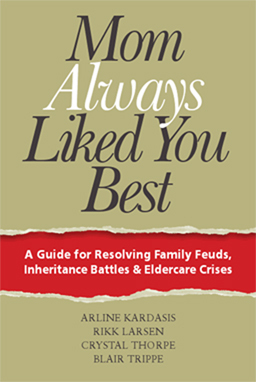 Our friends at Elder Decisions, Arline Kardasis, Rikk Larsen, Crystal Thorpe and Blair Trippe, have written a great new book on resolving family disputes, Mom Always Liked You Best: A Guide for Resolving Family Feuds, Inheritance Battles & Eldercare Crises. Fights over elder care issues can sunder family relations forever, often bringing up tensions and conflicts dating back to childhood. The Elder Decision team provides step-by-step advice on how to resolve family disputes, hopefully strengthening family ties and preventing all out war. It is useful reading both for families facing these issues and for anyone advising them. Mom Always Liked You Best is now available on Amazon.com. Mom Always Liked You Best will be available on Amazon in mid-May.